Need some country flags for your school or business? Flagman.ie have a large selection of country flags for sale. In our country flag section of our online store we stock 3ft X 2ft, 5ft X 3Ft and bunting at extremely competitive prices. 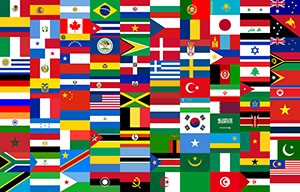 We have over 130 country flags in stock ranging from Afghanistan right through to Zimbabwe. All the flags are screen printed onto 100% woven polyester in extremely clear and very bold and bright colours. FlagMan.ie are one of the biggest suppliers of country flags to both wholesale and the domestic markets in Ireland. We are extremely proud of the quality of flags we have for sale and we are 100% confident that you will be completely satisfied with your purchase. FlagMan.ie also provides FREE shipping on all our country flags to anywhere in the Republic of Ireland. Along with our quality flags at very affordable prices, our customers are guaranteed to be making the right choice by shopping with us. If you are looking for a flag that you are unable to find online then contact us. Customers can contact us by dropping an email to info@flagman.ie or by calling +353 (0)857024810. In addition, you can view our country flags categories here.